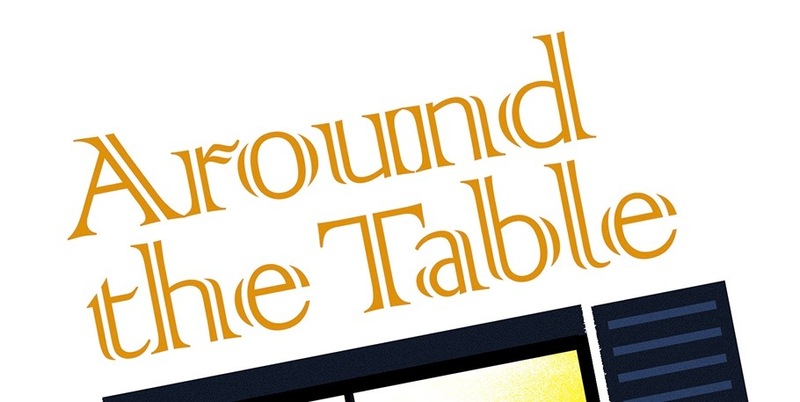 Around the Table Book: What's On My Table? I love the feeling I get when I see a well dressed table. I could be in a furniture store, a friends' home, a restaurant, or my own house. When the runner or tablecloth and centerpiece come together in beauty, style, grace, and a touch of whimsy it brings a smile to my face. It's true, when my four children were all at home, I did very simple centerpieces most of the time--a flower in a vase, a couple of candles, a bowl of fruit--but I always took time to make sure there was some kind of centerpiece on the table. Now that I have more time and less people to play with the centerpiece, I often try to get that look in my own home. A centerpiece is always on the table, even when we aren't eating, even when I'm home alone, even when my grandchildren are visiting. So what's on my table these day? Autumn! 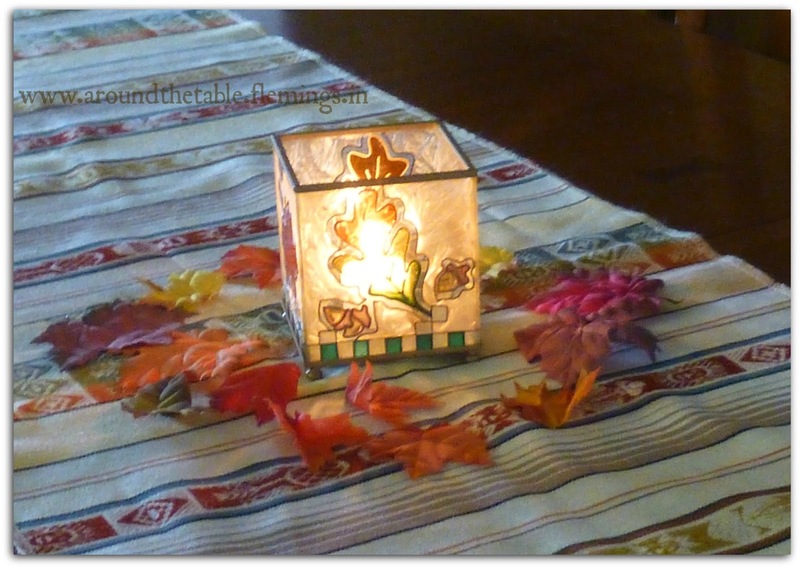 One of the things I think is fun is to find things around my house to use as part of my centerpiece. I'm not the kind of person you will find with a variety of silk flower arrangements in different hobby store vases. I'm more likely to look through my knick knacks and kitchen to see what I can come up with to decorate my table. 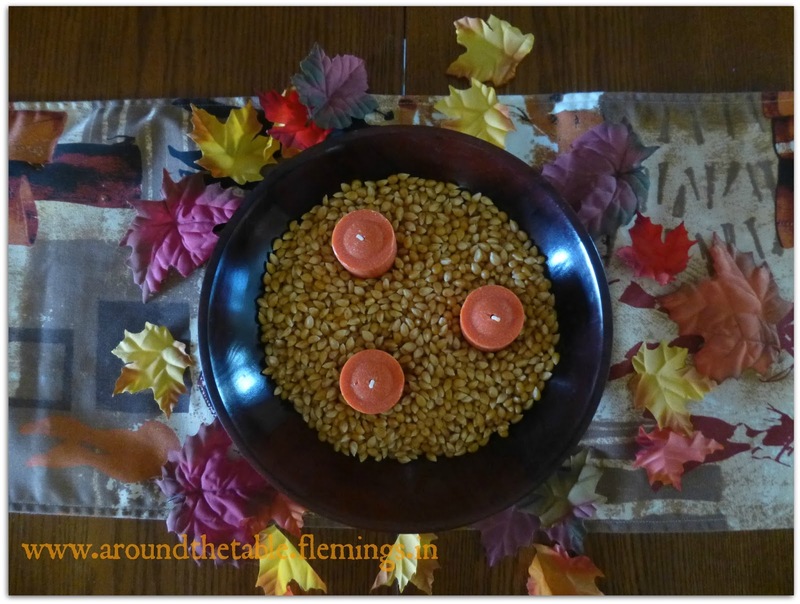 So when I saw a photo of a bowl filled with popcorn and a candle in it, I knew that was a centerpiece that was just right for me! Popcorn is one of my favorite snacks! My wooden fruit bowl from the Bahamas was just right along with my pumpkin spice votive candles, and dollar store silk leaves on a table runner from Africa in the right colors. I revisited the popcorn theme in a clear cylinder vase from my son's wedding. I put one candle in and put my scarecrows on guard duty beside it for another idea. I bought a green, rectangle plate when I was in Goodwill with a friend a couple of years ago. When I saw the plate, I knew I wanted to add it to my collection, but I wasn't sure what I would do with it. Normally it lives on our guest bathroom vanity with some seasonal decoration, but I decided to move it into a more public eye on my table. A few years ago I bought a leaf decorated candle holder that is my old standby for September and October table tops (before the Pilgrims come out). With a lit candle, a few silk autumn leaves scattered around it, on a runner from Ecuador and my table always looks festive. 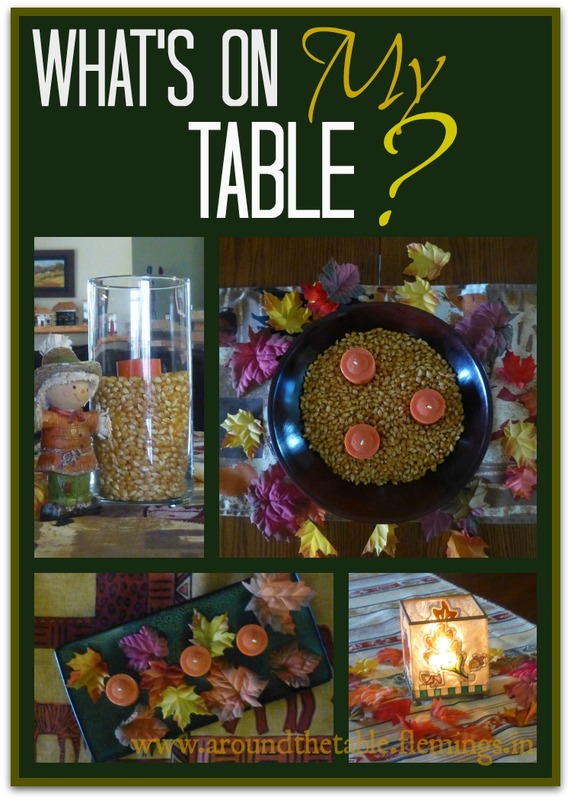 For more ideas on centerpieces click here and here. Here's a unique centerpiece idea. And my philosophy on family meals and centerpieces is here. Lovely fall décor. 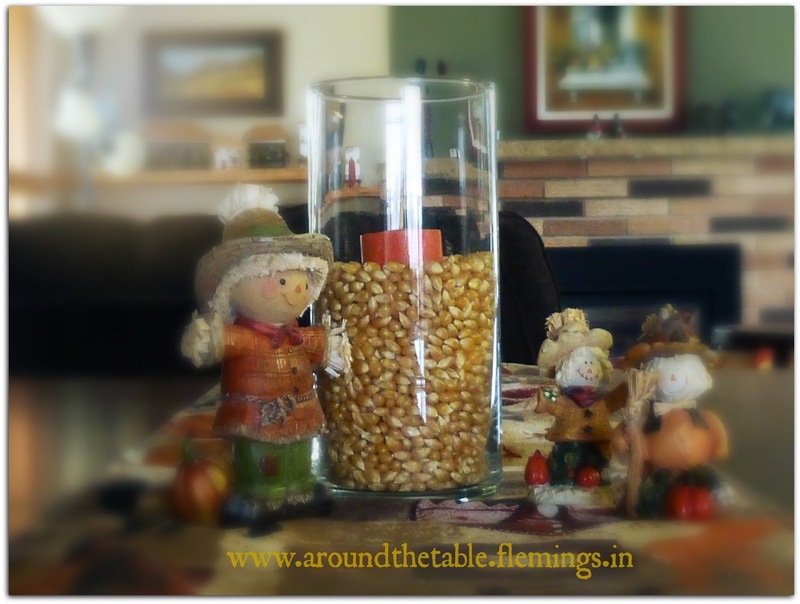 I love the little scarecrows and the idea of corn in the vase. I have a few pumpkins with faux fall leaves and candles about. Thanks for sharing at the Inspiration Spotlight party. Hope to see you again soon.